Buy Face wash Online @ Cheap Rates from HealthBuffet - Arlak Face Wealth Facial Wash considered as one of the best facial washes which contains best ingredients which are used to get rid of acne and pimple problems. It helps in Moisturizing Your Skin. With the help of Arlak Face Wealth Facial Wash you can Protect from Sunburn. 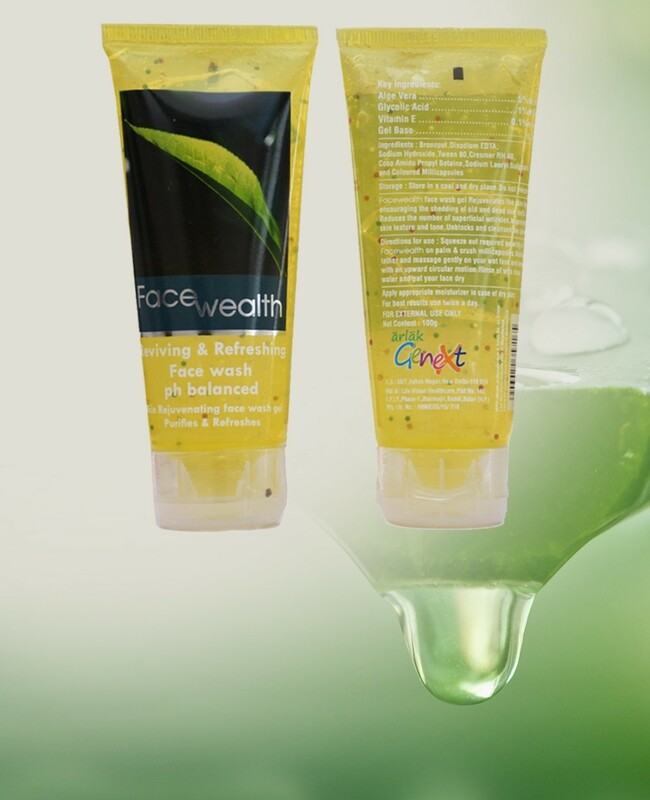 FACEWEALTH Face-Wash helps in Reducing Acne. FACEWEALTH Face-Wealth Prevents Face Wrinkles and Premature Aging of the Facial skin. FACEWEALTH Face-Wash has Soothing Effect on the Skin, Especially upon Rashes and Irritation to Prevent Sore and Redness. FACEWEALTH Face-Wash Acts as Anti-Inflammatory and the Compounds Penetrates deep into the Skin to Cure Blackheads, Dullness and Oiliness. The Face-Wash Minimizes the Appearance of Pores and Clears the Skin from Dust and Pollution. Aloe vera is a type of cacti that belongs to the Liliaceae family and is widely found in India. For years now, this plant has been used for medicinal purposes and skin conditions due to its healing nature. The best part about aloe vera is that it works wonders for oily skin since it doesn’t have a greasy feel. Aloe vera increases the water content in your skin leaving it deeply hydrated. The healing properties of aloe vera can also help treat sunburn since it forms a protective layer on the skin and gives your skin that punch of moisture. Full of antioxidants, aloe vera helps heal sunburn much faster. You may not know this but aloe vera gel contains two hormones—Auxin and Gibberellins. These have anti-inflammatory properties that have the power to reduce bacteria in the skin thereby helping combat acne. Along with that, it soothes the skin making it feel less itchy and flaky. Vitamin E is one of the most important ingredients for healthy skin. While the body releases some vitamin E into the skin through natural oils or sebum, you can increase your intake by consuming more vegetable oils, nuts, and green vegetables. But eating the right foods doesn’t necessarily mean your skin gets all the vitamin E it needs -- creams can provide specific forms of the vitamin not found in food. Sunlight generates wrinkle-causing free radicals, but applying a vitamin E cream can boost the skin’s natural defenses against the harmful ultra-violet light. It protects against damage by both blocking and absorbing the UV rays; vitamin E is thought to provide more protection against UVB than against UVA rays, so the cream shouldn’t be relied on as a sunscreen by itself. Medical studies have found creams that combine vitamin E with vitamin C have a greater ability to prevent sunburn. The world is full of damaging free radicals, and sunlight is just one of them. In addition to premature wrinkling caused by sun exposure, free radicals in pollution can reduce the skin’s natural levels of vitamin E, making it more susceptible to wrinkles. Smokers are bombarded by these damaging substances from both inside and out -- cigarettes cause the body to produce free radicals and the smoke itself is packed with them. Moisturize with a facial wash containing vitamin E, and you can harness its anti-oxidant properties to help protect against each of these types of potentially aging free radicals. It’s also thought that facial wash containing the alpha-Tocopherol form of vitamin E may reduce the depth of existing wrinkles and shorten facial lines. It has the smallest molecules in the group so is able to penetrate skin deeply and easily, making it the most effective for treating fine lines, acne, blackheads, dullness, oiliness etc. Provides a remarkably even exfoliation of the skin. Releases and dissolves dead skin cells - clearing up blocked pores and blackheads. A very effective acne treatment - particularly cystic acne which is caused by deep blockages of dead skin cells and sebum. Reduces fine lines and signs of premature aging by increasing cell turnover - meaning younger, healthier cells are now visible on the skin's surface. Acne scars (and other scar lesions) respond well to consistent glycolic acid treatment. Further products and treatments can penetrate deeper as it removes the 'barrier' of dead cells and surface grime. The effects are compound - meaning frequent use will provide better and better skin. It minimizes the appearance of pores by keeping them clear and helping the surrounding cells to strengthen and regain elasticity.